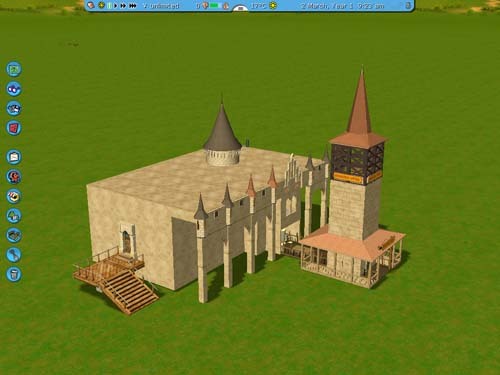 Description: It’s the recreation (or I tried) of the “Elvarázsolt Kastély” (“Enchanted Castle” or “Magic Castle”) of the Budapest Vidámpark. It used to be one of my favorite rides. It’s a “sheath” for the Crooked House ride – because I think that’s probably the ride that resembles it the most out of the standard in-game rides. (Or maybe the House of Fun, but that's larger.) This is why it has the tower on the rooftop too – which I believe was originally flat – to hide the top of the Crooked House’s roof. 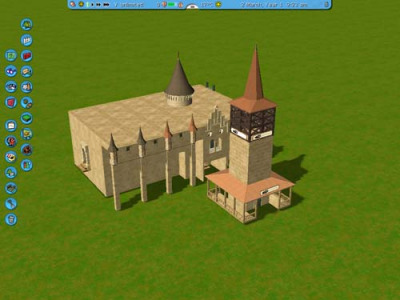 Originally, the front tower was the ticket selling booth, but that can't be done in-game, and since I guess it would look ugly if the guests would walk through the scenery ticket office with desk, pictures and stuff, it's now just decoration, but it's one of the signature parts of the Elvarázsolt Kastély, IMO. Two pictures are included in the set for the billboards. You notice the top of the tower, right? It can be seen from afar. Of course, my humble re-creation is like always, nothing compared to the original.